Last week I talked about how to activate a window just by moving your mouse over it. This week, let's focus on ways you can get more from your mouse. When you're viewing a document in Word, Excel, or PowerPoint, a flick of the mouse wheel scrolls your document up or down, just like in a Web page. Move your cursor up to the Ribbon, however, and the mouse wheel takes on a different function: It scrolls through the tabs. I'm not saying this is any faster or easier than just clicking the tab you want to view, but it does give you an alternative. Anyway, give it a try. Firefox users can do likewise: When you've got more browser tabs than will fit on the screen, just mouse over the tabs and spin the scroll wheel to cycle through them. One of my all-time favorite Firefox tips is holding down the Ctrl key and using the mouse wheel to quickly zoom in or out. 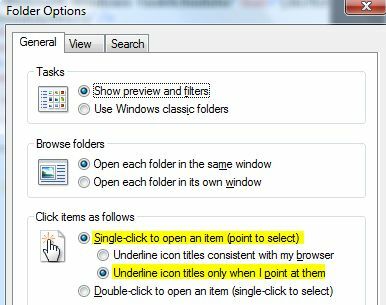 Another all-time favorite: Opening a Web link in a new tab by clicking it with the mouse wheel. It's true! Give it a try. Go ahead, I'll wait. Now, this may not work if you've installed your mouse maker's utility software and programmed the rodent to do something else when you click the wheel. But the default behavior in Firefox, Internet Explorer, and Google Chrome is to open the clicked link in a new tab. Of course, in today's Web-powered world, double-clicking is an anachronism, a vestige of old-school computing. So why don't we ditch it altogether? After all, desktop folders and program icons are really the only items that need two clicks. Surely Windows offers a single-click solution? Click Start, type Folder Options, and then hit Enter. In the General tab, find the Click items as follows section, then enable Single-click to open an item (point to select). Now decide which of the two "underline" options you want. The first keeps all clickable items underlined at all times, much like links in your Web browser. The second keeps the underline hidden until you mouse over an item. I prefer the latter, but you should try both to see which option you like best. Note that if you're really used to double-clicking, it'll probably take you a few days to break the habit. This method also makes file selection a little trickier, especially if you're accustomed to the practice of Ctrl-clicking multiple files. Now, instead of clicking each file in turn, you just hold down the Ctrl key and mouse over each file you want to select, pausing for about a second on each one until it becomes highlighted.